I got this book for Christmas in 2016. Due to a different reading project I was doing in 2017, I didn’t get a chance to actually read it until this month. For someone (me) who really despises war history in general, these diaries are a way for me to connect with history. To read what Astrid was thinking and feeling about the war and to learn how it affected Sweden and its neighboring countries – what a unique view into history. The little details like what was rationed when and how people reacted to it were my favorite parts — these little pieces of history might be lost to time without these diaries. It’s fascinating to relive the war in an era before worldwide news on television and the internet. Rumors, who heard what from what source, and of course the letters she read — these were her Twitter. Astrid also freely wrote what she thought of the players involved (“those poor devils!” she writes of the Italians at one point). 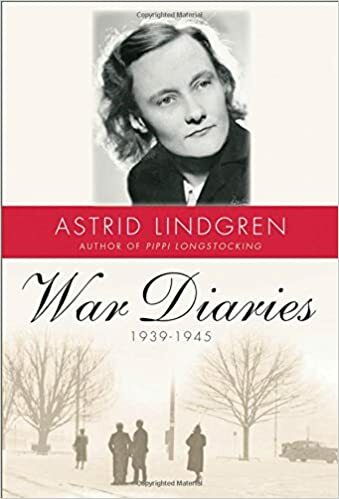 Then there’s Astrid-as-an-author and for any fan of her works this diary is important because it all began here: her success with Britt-Mari and later Pippi. English readers don’t know Britt-Mari because for the life of me, I cannot find a translated version of the book (anyone?) but of course we all know Pippi Longstocking. And Pippi was born during the war. In fact, if not for the war, we can assume circumstances would have been different enough that we would never have met Pippi. She would never have existed. One can’t help but wonder if Pippi’s success – not only with Astrid’s daughter Karin but also the world – was in part because the world needed the kind of chaos that Pippi brings — fun, childish and childlike chaos — as opposed to the years of death, destruction and emotionally-draining chaos the world had been suffering. Yes, this book drew me in because it’s Astrid’s words — but even if this wasn’t the work of my most favorite author, it would be an incredibly interesting book.